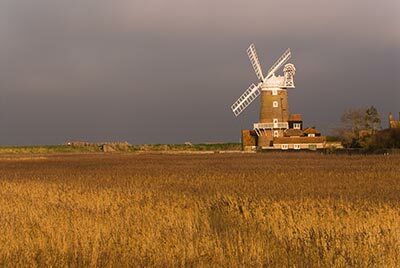 Cley Mill must have been photographed a thousand times. One a dull January afternoon I went out to get some pictures of reeds in winter for Flowers of the Norfolk Coast. As the short afternoon drew to an end the sky became duller and duller and all of a sudden there was an extraordinary light, not only showing the warm colours of the reedbed to perfection, but also the contrastingly white sails and superstructure of the mill.